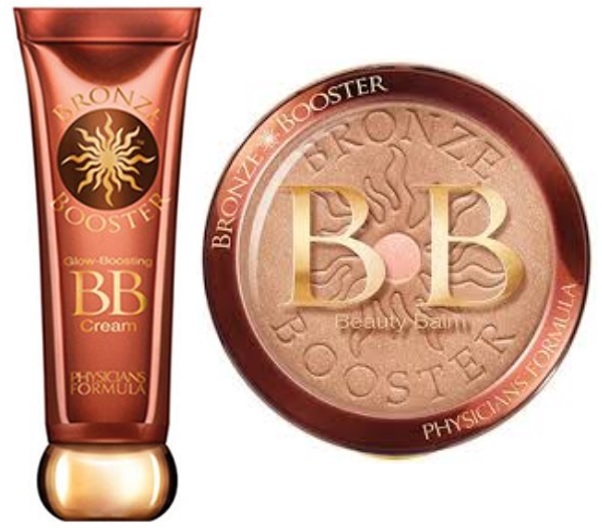 Physicians Formula Bronze Booster Glow-Boosting Beauty Balm BB Cream or Bronzer - $19.99 - delivers a radiant glow with multiple beauty boosting benefits with an advanced formula that combines the benefits of a BB cream - by protecting moisturizing, smoothing, brightening and softening lines - with the glowing finish of a bronzer. The bronzing action comes from an advanced triple-action bronze boosting glow activator technology that provides an instant and lasting bronze glow that easily builds for the desired level of streak, orange and stain-free bronze colour and includes: kapi kacchu seeds & phospholipids to moisturize and help extend the glow; ceratonia siliqua - a cabob tree extract that works with skin to naturally enhance a healthy-looking bronze glow; and vitamins C & E - potent antioxidants to help improve skin's clarity and radiance. The cream comes in Light to Medium and the powder has a choice of Light to Medium and Medium to Dark and are both fragrance, gluten, paraben and oil free, hypoallergenic and non-comedogenic.